After many failed business models, Seattle company DevHub has found a sustainable business model that doesn’t rely on Google. It was the fall of 2010 and DevHub was running out money. Which meant it was running out of time. The company had raised $2 million and had gone through a couple different business models. But nothing stuck long enough to sustain the business. The company had about 10 payrolls left, and then it was toast. Mark Michael, Geoffrey Nuval and Daniel Lee Rust knew they were on to something. Their company DevHub began in 2007 as EvoLanding, a service that could semantically build websites that would attract search engine bots and churn out cash. Auto creating web sites that you couldn’t tell were machine generated was tough but they thought they had found a way to do it. Investor Rob Monster gave them a vote of confidence and seeded them with $275,000 to take their product to the domain market. The next year domain owners, looking for an answer to declining parking revenue, submitted over 1 million domains to the platform. The growth was stunning, and five additional investors kicked in $580,000. The results were good, too. Sites that got little traffic suddenly got a lot and started pulling in strong revenue from Google Adsense, affiliate links and other ad networks. It wasn’t until the end of 2008 that the company started noticing a problem. It noticed that, after a few months, some sites would lose their relevancy. They could grow a site with relevant content for a while, but then the automated tools would start to break down when it came to relevancy. With lost relevancy came lower search traffic. Still, the company marched on. In the beginning of 2009 the company took a good look at what it had: a site creator that resulted in search traffic, good ways to monetize web visitors and access to good domain portfolios. The company decided it was time to open its system up a bit. It opened up all of its site building modules to domainers through DevHub.com so they could make sites themselves. Sites with soul that they’d curate over time. It worked. The company became profitable (temporarily) later in 2009. Example of a site built with the early EvoLanding system. Toward the end of 2009 the company took on an additional investor who injected $850,000. But shortly after the 2010 New Years’ bubbly had gone flat, the company realized it had a bit of a problem. It had given these great tools to domainers, but domainers weren’t finishing sites. They were basically creating parked pages on the system. 80%-90% of the sites were unfinished. Competitors offering similar site building solutions felt the same pain. If sites weren’t finished and curated, they didn’t get good search traffic. And if they didn’t get good search traffic, they didn’t make much money. That’s when the company got its next idea: add gamification to the web site building process. It would be SimCity meets Adsense meets WordPress. As clients developed more of their web site they unlocked new templates, monetization options, etc. When DevHub rolled out gamification in July 2010 it got a lot of tech industry press. But it also got a strong reaction from its existing customer base. “What the hell did you just do?” they asked, as co-founder Mark Michael recounted to me recently. The company privately wondered if adding gamification, a hot trend at the time, was the right decision. Gamification drove a lot of small business customers to the site. They’d finish out sites, which was DevHub’s goal. But small businesses didn’t add monetization to their sites, so DevHub didn’t make any money. By this time money was running low. The company had 30 employees and its burn was $150,000 a month. It had about 10 payrolls left, and then the bank account would read zero. As the co-founders surveyed the situation, they didn’t see much they could do. At the end of the day all they had a web site creator. In October 2010 the phone rang at DevHub’s tenth floor office in Seattle. On the other end of the line was a large North American telecom company. It had 1.2 million small businesses and it knew it needed to offer digital products to them. But how, and how at scale? 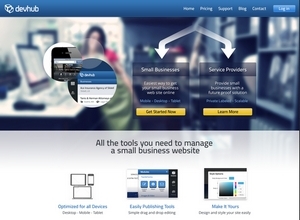 The company called DevHub to inquire if it would white label its web site tool. Something about DevHub — be it the gamification, the ease of use, the press — had attracted the telco’s attention. That first deal led to six figures up front and a monthly licensing fee. DevHub is updating its site to reflect its direct and white label solutions. Fast forward to 2013 and the company has 26 private label customers paying a couple bucks per month for each site they launch. There are around 100,000 active paying sites on DevHub. In most cases the customers (typically Yellow Pages operations) use the DevHub platform themselves to develop web sites for small businesses. In some cases customers open the tools up directly to the small business end users. Finally, DevHub had found a predictable, recurring revenue base — that was not dependent on Google. With 26 white label customers, DevHub is ready to broaden its market. It is reopening the DevHub platform directly to end users who want to create sites. It already has one million domains on its direct platform that have been created over the years. About 10% of those are completed sites in which the owners log in to make updates each month. DevHub hopes to grow that number while also charging for its platform. It’s also offering a more affordable white label solution starting at $249 that is targeted at agencies and smaller web developers. Additionally, it’s expanding its services to mobile and Facebook. It’s been a long journey, but DevHub’s core team has stuck to it. It looks like that’s finally paying off. Congrats Andrew for telling this story. It is a triumph of determination and iteration by the capable team of Mark Michael and Daniel Rust. The DevHub team experimented around the core until they found a winning model that they could scale profitably. As for gamification, I think it could be viewed as a diversion. That being said, in fairness to Geoff Nuval, who championed that effort, the resulting UI upgrade made the platform more intuitive and more usable — something that is easy to under-appreciate yet is absolutely critical for achieving scale. In some ways, the UI upgrades set the stage for the Yellow Pages deal which in turn laid the foundation for sustained profitable growth. Bottom line: DevHub is a case study of determination. In general, it is no small feat to build a meaningful internet company. Anyone who has done it more than once — without selling their soul — can attest to the combination of determination and serendipity required to build a great (internet) company. Kudos to the DevHub team. I get the impression that Devhub don’t care about non “white label” accounts. Once in a while I do get a return email from one of the 3 upfront guys, but support does not work, don’t amswer, won’t fix problems. I wish they would do more for the small business guy trying to build out sites. Interesting to hear how they pivoted over the years. The UI for site building is awesome. Just keeps getting better. Hard to justify using any other platform once you learn the interface and see what you can do with it. The support from Devhub is terrible and will hold them back from ever achieving their goals. Avoid these crooks like the plague. They will not release funds earned over the years with their ads. Their servers are notorious for very slow response times but recently I’ve had my sites go down for entire weekends. I have several support tickets that have gone unanswered for months. Seems like they have gone out of business.